The nearby place to party just outside of Rocky Point is Cholla Bay, in Sonora, Mexico located a short drive north of Puerto Peñasco (Rocky Point). 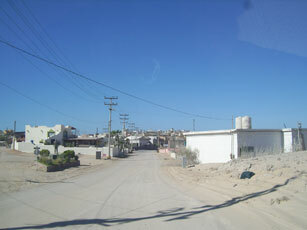 Cholla Bay has grown into one of the largest "American" subdivisions in Mexico today with a variety of unique custom style homes and tourist attractions. Cholla Bay sits on the beach of the Sea of Cortez (Gulf of Baja California) in Mexico, about 70 miles south of Arizona. 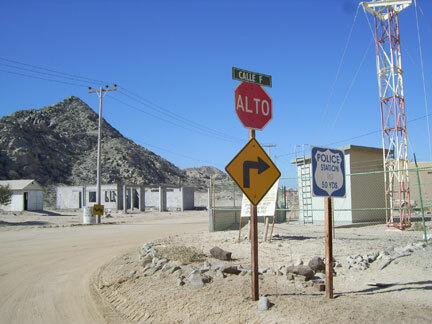 The Spanish name for this small community is Bahia La Choya. The more well known English spelling is Cholla Bay. The small town of Cholla Bay has grown with the development of new homes for mostly Americans and Canadian investors attracted to the rural living. The popular JJ's Cantina is the major sea side attraction. Cholla Bay has one main restaurant that has a reputation of its own, JJ's Cantina. See dining options in Cholla Bay. VBRO La Choya rental properties can be booked online through VBRO's vacation rentals in Mexico. Vacation Home Rentals have listings for La Choya vacation rentals By Owner . Cholla Bay has available real estate properties, vacation homes, rentals and vacant land at greatly reduced prices. Cholla Bay Homeowners Association (CBHOA) Cholla Bay resident community news, calendar of events, features, forum and information center. Cholla Bay, Mexico is easily accessible by car or small plane from Rocky Point (Puerto Peñasco). Click on the Google map of Cholla Bay to enlarge it and view street level. Cholla Bay has long been a destination spot for Arizona vacationers. The new highway from California, expanding airport and cruise stops will bring in more visitors looking for a second home, a summer or winter rental, or a place to retire. 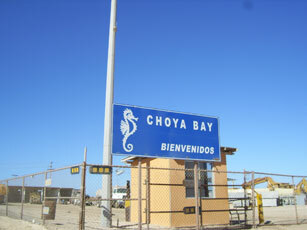 As a developing community, Cholla Bay has fewer amenities than its neighboring town of Peurto Peñasco. But, Cholla Bay is the home of many annual sporting events, including fishing and golf tournaments, skydiving, off-road activities, sail boating, and many family activities. The major attraction of Cholla Bay is for those who want to be close to the beach and bay without the crowds of Rocky Point. Fishing in the Sea of Cortez and inlet bay are popular sports, along with gliders and water skiiers. Cholla Bay homes are available for rent and sale. There is some new construction on lots and some properties still in construction stages. Find a list of homes, lots for sale or rent in Cholla Bay. Photos: The road into Cholla Bay. Statue of Sandy Beach Resorts (SBR) founder Mr. Silvestre Gustavo Brown G surrounded by shrubs (left side of street entrance) in the foreground. Cholla Bay map, courtesy of SBR Realty. Luxurious and affordable vacation home and condo rentals in Barra De Navidad, Riviera Nayarit, Rocky Point, San Carlos, San Felipe, Puerto Vallarta and Bahia Kino. © 2007-2016 EMOL.org / Entertainment Magazine On Line. All rights reserved.